Developed in the USA around the 1970s, superinsulation is an approach to building design, construction and retrofitting. High value thermal insulation in walls, ground floor and roof. Depending on the amount of air trapped between a material, it will have different insulating cpacities. For a high capacity, the air within the material must be still and dry; therefore less heat can transfer through the material. Heat conduction through a building element is measured by the U-Value. Sourced from The Building Regulations: L2A Conservation of fuel and power in new buildings other than dwellings. Table 4. Insulated enveloping containing no cold bridges. Airtight construction, inparticularly with doors and windows. Close attention would have to be paid to every construction detail in the building envelope, especially with doors and windows. By sealing openings and keeping the building airtight, heat would not escape easily and keeps the interior at a comfortable temperature. Windows are thermally the weakest point of an insulated building envelope, but can be improved by using triple-glazing with Low-E glass and inert gas fill. Low-E: With low-emissivity windows, most of the heat would be reflected away rather than absorbed. This means that indoor heat would not escape, keeping the building warm. In summer time, it also means that heat from the sun would be reflected away, simply allowing light through and so keeping the building cool. Inert Gas Fill: Less conductive and slower moving gas is filled between the cavities in windows, replacing air. This creates an optimum insulation performance as it reduces heat and sound transfer. Heat is easily lost through ventilation systems in a building. Therefore mechanical heat recovery ventilation could maintain high quality air conditions within a building, but also recover heat of a rate of up to 90%. The majority of heat is sourced from intrinsic heat sources, such as the occupants, electrical appliances, heat from the sun and artificial lighting. Only during very cold temperatures would electrical heating be required. 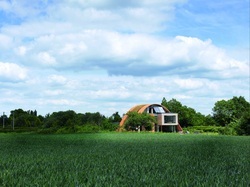 The image above shows the Crossway house designed by Hawkes Architects in Staplehurst, Kent. It is a perfect example of a superinsulated house, which became Passivhaus certified in July 2010.